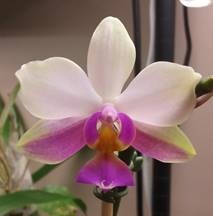 I remade this hybrid to get more fragrant summer flowering phalaenopsis. I got flasks of this hybrid back in 2007 and sold one to Annette. She flowered several - and commented that most of these have similar look. It's not a surprise that Phal sanderiana is more dominate in flower form but we can also see the influence of Phal bellina in this flower. Nonetheless this hybrid has beautiful round leaves. 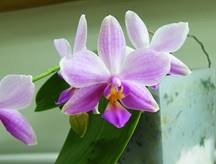 I am using this flower to breed with Phal Dragon Tree Eagle. My goal is to add more color this primary hybrid and still have my pretty round leaves. That's very nice, Peter. How do you expect it to flower/ By that I mean, short spikes with few flowers; long spikes with numerous or in between? Earth is the insane assylum of the Universe. If you selfed this, you would get a much wider variety of color patterns and shapes and flowering habits. With primary hybrids, F2 is where the fun starts!!! F1 is always going to be uniform, since the parent species are usually homozygous at most loci. But selfing will give some with a double dose of bellina at a color locus, and some with a double dose of sanderiana. Same at all other loci, and you'll get an infinite number of combinations across loci. So if I were you, I'd self or sib this! I'd buy a flask. Inflorescence is about 10 inches, much shorter than species parent Phal sanderiana, but longer than Phal bellina. This is 2nd bloom. This flower is produced from old infloresence from last year. There is a new inflorescence with 6 buds that will open soon. Flower arrangment looks good - but we'll have to see when all flowers are open - if spacing is too crowded or okay. I added Phal Dragon Tree Eagle to bring in color - and to add violacea to this flower. But I like your thinking, Lou. 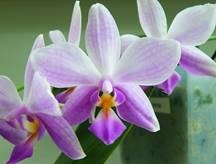 This year I will save pollen of my Phal bellina to pollinate with Phal schilleriana in February. I'm looking forward to the next spike opening, it sounds like the type of spikes I like. Not tootall, not too short. Lou's thinking sounds like the possibility of some very nice colours. Hey, I got a phal from Annette Lurton in KY (Purple Surprise)...she gave me one of the plants from the flask she got from you several years ago. I've had it now for a few years (or more) and it's bloomed out perfectly normal each year...until this year. This year it's later than normal and it's a white and pink rather than it's normal pink and darker pink/purple tones. Oh, and it has a little bit of green tinged edges a la a bellina. It's like I'm looking at a completely different phal and it could be the strangest thing I think I've ever seen. So...I'm just curious if you have any theories on why the change. It's very pretty but damn it's strange. I was talking w/Annette about it and she suggested I pick your brain for possible causes/explanations. Also, I only have 3 flowers this year and while I don't think that has anything to do w/anything...still, thought I'd mention it anyway. Previous blooms looked like this and I know I've bloomed it at least 3yrs prior (maybe even 4yrs?) and they all have always looked like the below. I'm adding both of these pics because the camera I had at the time didn't always get the colors right but the "true" color was kind of in the middle of these two. I thought this change is quite cool and share them here. It's not usual for flowers appearance to change due to growing environment (temperature, light intensity).